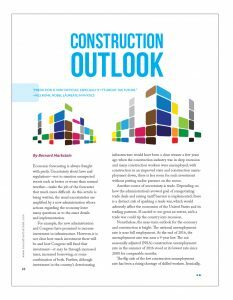 Bernard Markstein, PhD, is the President and Chief Economist at Markstein Advisors, an economic consulting company providing analysis and forecasts of the national economy and construction activity. Dr. Markstein has over 25 years of experience, which includes analysis and research in residential and non-residential construction, housing, real estate, financial markets, macroeconomic issues, and regional markets. He can be reached at bmarkstein@verizon.net. Economic forecasting is always fraught with perils. Uncertainty about laws and regulations—not to mention unexpected events such as better or worse than normal weather—make the job of the forecaster that much more difficult. As this article is being written, the usual uncertainties are amplified by a new administration whose actions regarding the economy leave many questions as to the exact details and implementation. For example, the new administration and Congress have promised to increase investment in infrastructure. However, it is not clear how much investment there will be and how Congress will fund that investment—it may be through increased taxes, increased borrowing, or some combination of both. Further, although investment in the country’s deteriorating infrastructure would have been a clear winner a few years ago when the construction industry was in deep recession and many construction workers were unemployed, with construction in an improved state and construction unemployment down, there is less room for such investment without putting undue pressure on the sector. Another source of uncertainty is trade. Depending on how the administration’s avowed goal of renegotiating trade deals and raising tariff barriers is implemented, there is a distinct risk of sparking a trade war, which would adversely affect the economies of the United States and its trading partners. If carried to too great an extent, such a trade war could tip the country into recession. Nonetheless, the near-term outlook for the economy and construction is bright. The national unemployment rate is near full employment. At the end of 2016, the unemployment rate was near a 9-year low. The not seasonally adjusted (NSA) construction unemployment rate in the summer of 2016 stood at its lowest rate since 2000 for comparable months. The flip side of the low construction unemployment rate has been a rising shortage of skilled workers. Ironically, the shortage limits the ability for further employment in construction as projects are stretched out or otherwise delayed to accommodate the limited number of available skilled construction workers. Training programs are working to fill the need, but that is a long process, leaving a gap between supply and demand that is only slowly being filled. Depending on what infrastructure projects are approved at the federal level and the speed with which they are implemented, the shortage of skilled workers could be exacerbated, hurting overall construction. With the economy performing better, the Federal Reserve (Fed) finally began to back off its extremely low interest rate regime. The Fed will raise its target federal funds rate by a quarter percent at least 3 times this year. Additional increases may well occur if fiscal stimulus threatens to overheat the economy. Given the administration’s spending plans, 5 increases in 2017 are very likely. Non-residential building construction rebounded strongly in 2015—following on a healthy 2014—but slowed in 2016, although still turning in respectable growth that year. Current dollar construction spending rose 8% for the year after advancing 14% in 2015. Note that the spending numbers are in current dollars and are not adjusted for inflation. Most of that spending growth was concentrated on “For Lease” construction (Lodging, Office, and Retail)—up 18% compared to 14% in 2015. Meanwhile, institutional building construction rose by 5%, down from 6% in 2015, which followed falling construction spending in 2013 and 2014. Heavy non-building (civil) engineering (or infrastructure) construction spending fell by about 1% in both 2015 and 2016. In 2015, that was driven by reduced spending on power construction projects (down 16%) following strong investment by that sector in 2014 (up 18%). 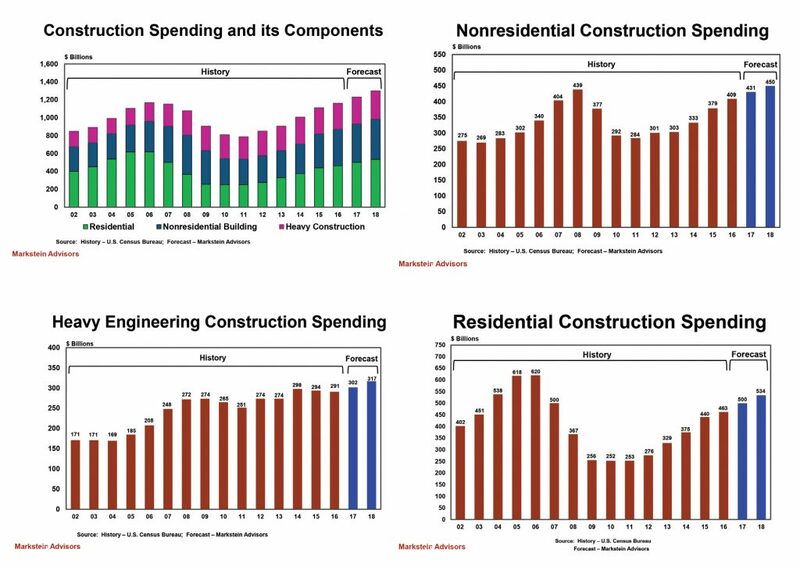 In 2016, construction spending was down in all major categories, except power construction and highway construction, which were up a minimal 3% and 2%, respectively. • Lodging. Companies have loosened their restrictions on travel following austerity measures during the recession and immediately thereafter. Leisure travel has increased as employment has improved and as households have felt more secure in their various job situations. The lodging sector vies for both business and leisure travelers. There has been considerable segmentation in the market as the industry tries to appeal to the various niches, from the budget minded to the luxury traveler. The result for the past few years has been significant investment in renovation and new building. That will largely level off this year with most of the increased spending due to increased construction costs. • Office. Although the square footage per employee has shrunk, the need for additional employees and reduced operating costs (coupled with pressure for “green” space) is pushing up spending on both new office construction and renovation/retrofitting older space. 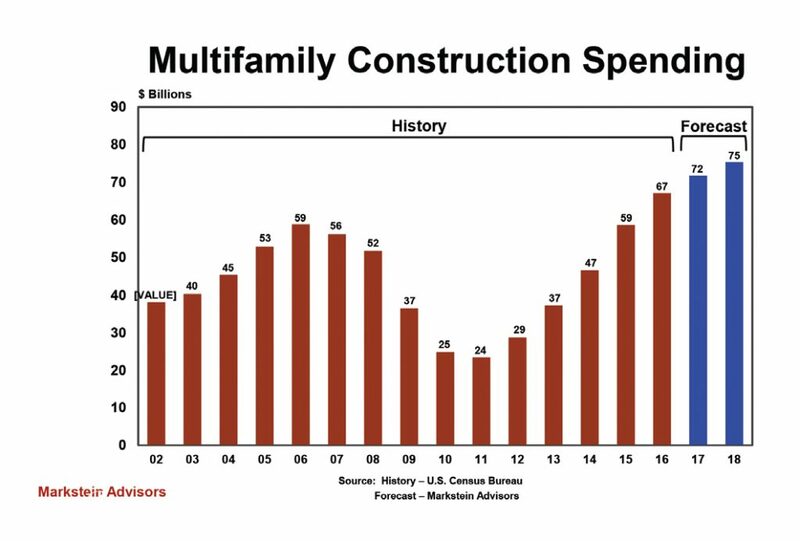 Spending on office construction has been surprisingly strong over the past 3 years—up 23% in 2014, up 18% in 2015, and up 25% in 2016. Expect healthy, but slower growth this year, in the low double digits—roughly half the 2016 rate. By 2018, that is likely to flatten out with increased spending matching rising labor and building materials costs. • Retail. The Internet has dramatically changed the landscape for brick and mortar stores in some categories (most notably for books and electronics), but the inroads for other sectors is limited or nonexistent. Grocery stores, restaurants, and various services (e.g., hair care) will not be supplanted by Internet alternatives, although these businesses may use the Internet as a means of marketing to and communicating with customers. Some retailers have successfully carved out niches in the market by also adopting the Internet as another sales tool and distribution channel while others struggle to adapt. Malls in particular are trying to meet the challenge as some of their large anchor stores have become vacant. The result is that mall management is renovating their vacant space and trying to make their properties more attractive to shoppers. Rising employment and expanding residential construction largely drive this category. Thus, some new malls are being built, but not at the pace of a few decades ago. Construction spending for retail increased 11% last year. This year and next, spending will at best match somewhat exceed rising construction costs this year and at best match them next year. • Health care. Uncertainty surrounding the Affordable Care Act (ACA) kept many health-care providers on the sideline over the past few years. That confusion continues as Congress and the administration move to repeal and replace the ACA. As of this writing nothing is clear on what the path forward will be and thus, health-care providers are reluctant to undertake major new projects. Most of the activity is for needed renovation and in a few cases, where the need is sufficient, for new facilities. Until it becomes clear what is going to happen with repeal and replace, health-care construction spending is unlikely to keep up with rising construction costs. • Education. For private education, the recovery from the recession and the rebound in the stock market meant resurgence in both contributions and the market value of portfolios over the past few years. Expansion plans previously put on hold were revived and new projects have been put forth. Meanwhile, public education in much of the nation suffered from reduced tax revenues as property values fell and school boards and legislatures faced opposition to any new tax or bond issuance. Rising house prices are now helping to improve property tax receipts. Also, parents are starting to push for new, updated facilities to address crowded and/or deteriorating classrooms. Given the time it takes for approval of new plans and new bond issues, this will be a drawn out process. Look for spending on education-related construction to rise somewhat faster than the rising cost of construction this year and next. • Multifamily Housing. The multifamily housing market was essentially fully recovered by the beginning of 2014. Since then, construction activity has largely leveled off. Any overbuilding in a particular market is quickly corrected as increased vacancy rates lead developers and their financial backers to stop new projects until the excess space is absorbed, usually within 6 to 18 months. With the ranks of young workers growing due to simple demographics and fear of homeownership still widespread among many, the outlook for multifamily housing remains bright with construction continuing around the pace set in recent years. The main change will be a slowdown in construction in the country’s largest cities and more activity in and around the next tier of “secondary” cities.